Applications are now being accepted for the famous Clarion Writers’ Workshop which has been training and encouraging aspiring science fiction writers since 1968. Writers in residence for the 2015 workshop will be Christopher Barzak, Saladin Ahmed, James Patrick Kelly, Karen Joy Fowler, Maureen McHugh, and Margo Lanagan. 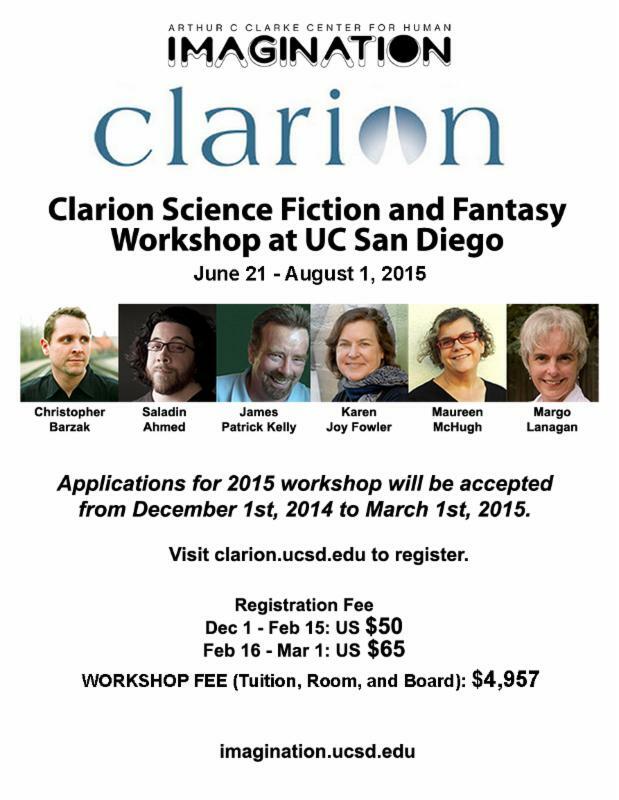 Held on the UC San Diego campus, Clarion is an intensive six-week summer program focused on fundamentals of writing sf and fantasy short stories. There is a long list of distinguished Clarion alumni. A different professional writer or editor conducts the workshop during each of the first four weeks. The last two weeks are run by a two-writer anchor team. Workshoppers are housed in college apartments, and classes are held in seminar facilities. The resident writers live nearby and are continuously available to students. Mornings are devoted to critiquing manuscripts in a workshop setting. Afternoons, evenings, and weekends are devoted to individual writing, conferences with the current writer-in-residence, social activities, and the completion of class assignments. There also are two other independently-run workshops with the Clarion name: Clarion South in Australia and Clarion West in Seattle, Washington.